I was wandering the halls of my son's school this last weekend, as I awaited what was to be the first in a series of performances by my teens. The little guy...not so little, at 13...had managed to snag the lead role in his eighth grade play, a Roman comedy by Plautus. Actually rather funny, as it turned out, and he did a great job with it. It had been an American Suburban Parent afternoon, as I picked up my older son from an all-day rehearsal for District Chorus, and then drove him an hour-and-a-half across the worst traffic in America to swim team regionals, only to then turn right back around to make my younger son's play. But as I meandered around his middle school, stretching my legs after three-and-a-half hours of kid-shuttling, I came across a sign. "Music," it said. 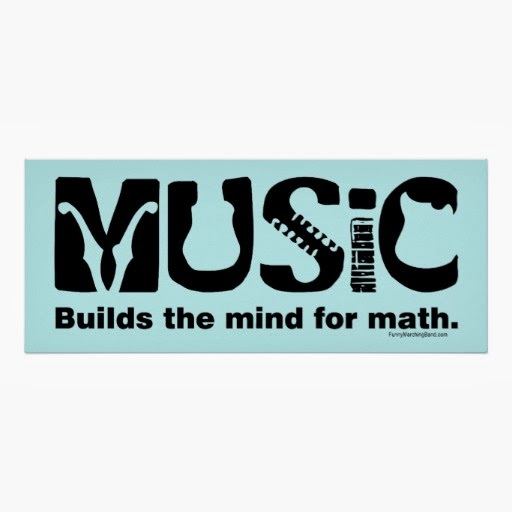 Only the word was cast out across a series of other subjects, with the "M" in music being the "M" in math. The implicit subtext: Music exists here because it helps us perform better academically. This is a more and more common refrain, as a focus on testing and metrics drives things like art and music, dance and drama out of our educational system. They are primarily useful, assuming they have utility at all, as a way to neurologically reinforce the important skills that we need to program into our children. The next day, at my older son's chorus concert, before what was a strikingly beautiful performance, one of the choir directors talked about the importance of music for brain development in adolescents. There was nodding in the auditorium full of parents, and in my mind's ear echoed the words of several dozen conversations with other parents of teenagers. Their brains are still developing, we say to one another. The bucket of crazy we're encountering now is just reflective of neurological rewiring, we sigh. If music helps with that developmental process, then it has value. Maybe. Drama teachers and music teachers are hard pressed these days. Even in Fairfax County, one of the richest counties in the United States, the arts are being cut back to make room for more testing protocols and more administratalia. And it strikes me, in all of this, that we're increasingly missing the point of both music and being human. Music has value in and of itself. It is not subordinate, or a supporting player. In terms of our humanity, when we assume that the primary value of any activity is its contribution to our productivity, we fail to understand the goal of productivity in the first place. Oh, we need to work. Sure. But once we've gotten a roof over our head and food in our bellies, we do not work so that we can work. We work so that we can sing, and laugh together, and take time to share our delight in this little flicker of life that we have been given. Music isn't a bit player, useful primarily because it prepares us for the workplace.